First-year law student Tim Peterson '10 began looking for summer work in the legal field early last spring. With little luck locating opportunities in Chicago, Peterson focused his search in the western suburbs of Chicago, closer to his home. His initial research identified The Law Offices of John J. Malm, P.C. as a prospect. The firm wasn't offering a position, but that didn't deter Peterson. Hoping to make a strong impression (although lacking an appointment for an interview), he dressed in a suit and tie and delivered his résumé in person. He did not know Malm graduated from Augustana in 1988. Malm's receptionist cordially accepted Peterson's résumé, thanked him for his interest in the firm and sent him on his way. Peterson admits he was a little disappointed. 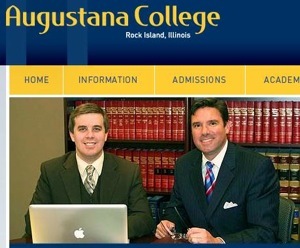 But when Malm later read the résumé, he noticed that the ambitious law student was an Augustana graduate. "As a small firm, we do not receive many résumés by hand-delivery," Malm said. "Having not posted an available position, I was surprised by Tim's visit. What was impressive to me was not only his academic achievements, but also his determination to find work. With a busy summer trial calendar, I decided we should give him a chance. We called him later the same day and asked him to return for an interview."